Could Braydon Preuss be on the move? MELBOURNE has emerged as a surprise suitor for lightly played Kangaroos ruckman Braydon Preuss. The 23-year-old signed a contract extension in October last year to remain at Arden St until 2020, but admitted to AFL.com.au in July that he was "pissed off" about being stuck in the state league. 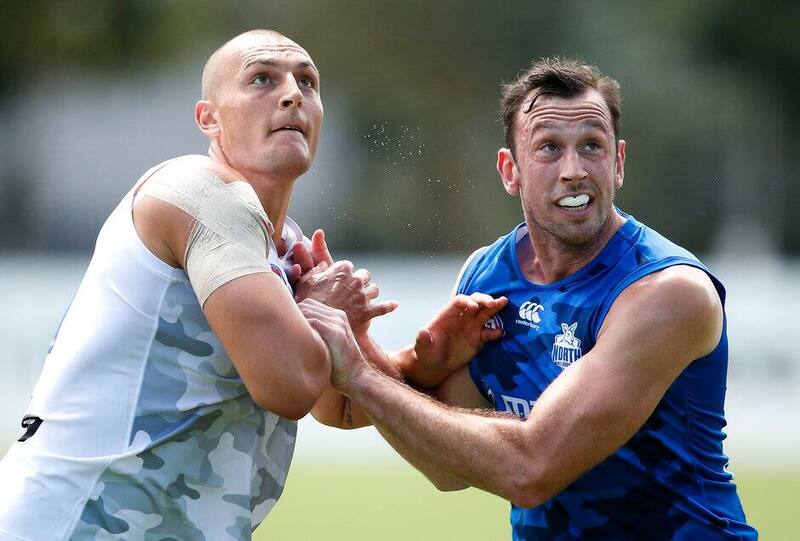 The Kangaroos are gauging rivals' interest in the strong-bodied 206cm Queenslander after Goldstein's form resurgence coincided with teenage ruckman Tristan Xerri showing promise in the VFL. Reborn defender Majak Daw can also play in the ruck for North if required. The Demons already have dual All Australian Max Gawn on their books, but their depth behind the 208cm giant is thin, with neither Mitch King nor Lochie Filipovic having played a game. It is understood Melbourne is keen on having a back-up big man of a similar size to Gawn that is capable of having a major presence in the middle. Gawn, who has had two knee reconstructions, played all 22 matches this season on his way to a second All Australian nod and winning the AFL Coaches' Association champion player of the year award. But he missed nine games in 2017 recovering from a serious hamstring setback, and the Demons' then-No.2 option Jake Spencer also suffered a shoulder injury and was subsequently delisted. Cameron Pedersen and Tom McDonald became Melbourne's makeshift ruckmen and were relatively competitive around the ground, but were little match for opponents in ruck contests. It is unclear whether the Demons would be open to playing Preuss alongside Gawn if they recruited him. Key forward Sam Weideman, a top-10 draft pick in 2015, has shown in the past fortnight – in Jesse Hogan's injury-related absence – that he is ready for regular senior football. Hogan and McDonald generally operated as Melbourne's only tall forwards this year, although the Demons trialled Weideman, who has supported Gawn in the ruck, alongside them in five games. Melbourne is entering a period where it is expected to be a premiership contender and a Gawn injury could harm those prospects. There are several clubs in the market for a No.1 or quality back-up ruckman, including St Kilda, Greater Western Sydney, Western Bulldogs, Port Adelaide and Essendon. West Coast could enter that picture as well if Scott Lycett elects to move clubs, on top of Nic Naitanui likely missing most of next season recovering from a second knee reconstruction.